One of the ‘Big 7’ widespread and abundant species, found in a wide range of habitats across the UK. 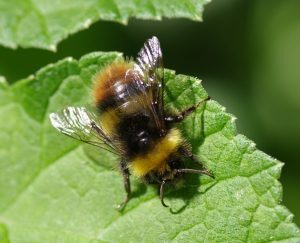 A small species, it has a red tail which varies in hue and extent, but is usually noticeably smaller and more of a dull orange than the similar Red-tailed bumblebee (Bombus lapidarius). The yellow abdominal stripe is frequently lost or reduced in workers, and males are often extensively yellow, including very obvious yellow facial hairs. As the English name suggests, this is a spring specialist, one of the earliest bumblebees to emerge from hibernation each year, and males can be seen as early as April or May. Queen Early bumblebee (left), Male Early bumblebee (right). Photo credit: Julia Matsis (right). The Bilberry bumblebee (Bombus monticola) and males of the Red-tailed bumblebee (Bombus lapidarius) can be similar but have much more extensive red tails, while the orange-tailed Scottish Isles form of the Heath bumblebee (Bombus jonellus) is similar but does not co-occur with the Early bumblebee.